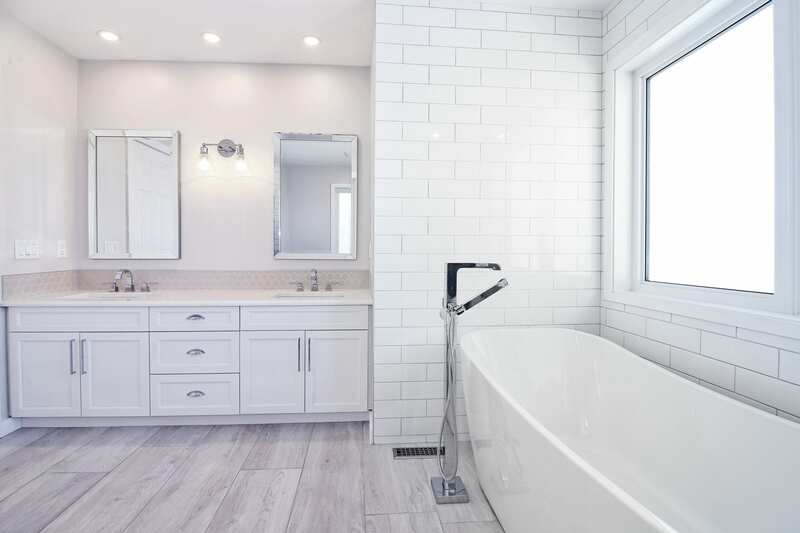 Reborn Renovations is an award winning home renovations company that specializes in Calgary bathroom renovations and bathroom remodeling services. Reborn provides innovative solutions and results no matter what the job size or budget may be. We strive to make your bathroom feel like your own spa or sanctuary and not just a place that serves its functional purpose. 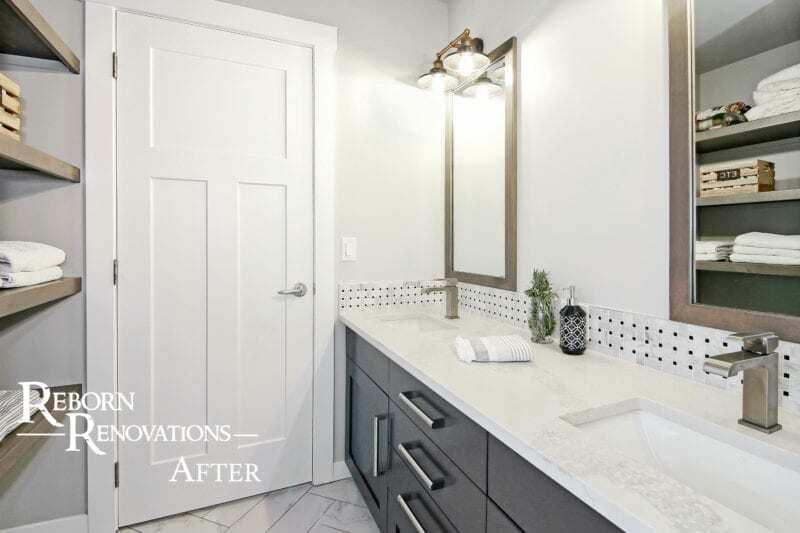 Our bathroom renovations create spaces that are fitting for both your lifestyle and personality. We have an eye for detail and we help our clients design and carry out the project of their dreams. Our main goal is to see our clients’ projects come to life. 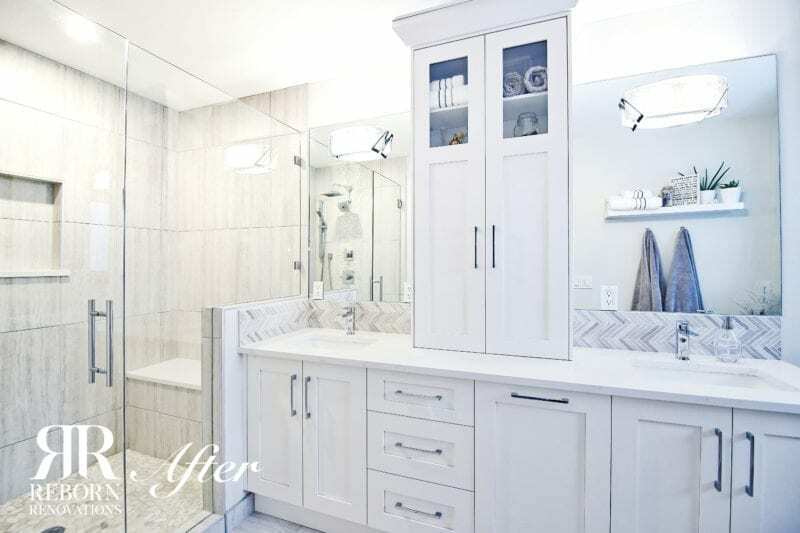 We also serve Airdrie And Okotoks, give us a call or contact us today for a free bathroom renovation estimate. Reborn’s team of bathroom renovators can help you build the bathroom of your dream. Get a free estimate today if your are looking for bathroom contractors in Calgary, Airdrie or Okotoks. Reborn provides a project manager for every bathroom renovation. The project manager acts as your one point of contact providing up to date scheduling and making sure every renovation need is met. From our detailed estimate to the final inspection, we make every effort to ensure your total satisfaction. Appointments are available at your convenience with professional, knowledgeable and experienced staff. Our mission is continued customer satisfaction delivered by excellent craftsmanship and our passion for quality. We are committed to working closely with you on your bathroom renovations projects to make sure we meet your specific needs. Bathroom and kitchen renovations are our passion! Reborn offers full bathroom remodeling services including carpentry, plumbing, tiling, framing, drywall and electrical. This gives you the opportunity for a full bathroom remodel or redesign. 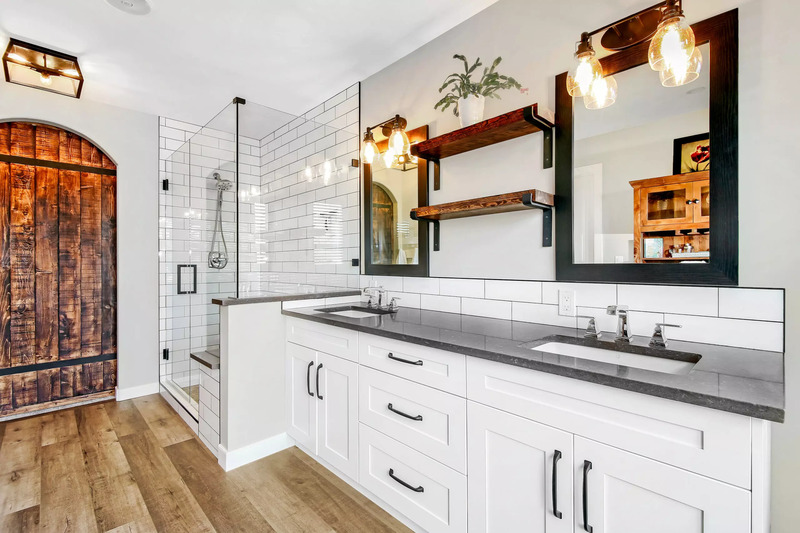 Our team of experts knows how to utilize your bathroom space in order to achieve your overall goal for your bathroom renovation. Reborn’s bathroom designers can assist you with bathroom design selections if you’re not sure what overall style and feel you’re trying to achieve with your dream bathroom remodel. We are passionate about what we do and we continually improve our skills to keep up with the latest innovations in construction. 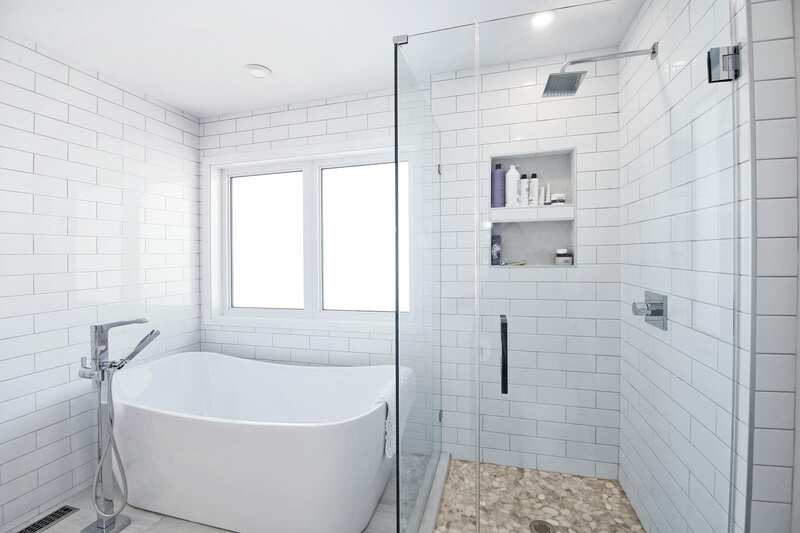 Our projects range from basic bathroom remodels to high-end residential projects. We are always in step with the latest designs and fashions which accompany the modern lifestyle. Check out our photo gallery of bathroom renovation ideas & bathroom remodels we have done for our clients. Contact us to talk to our specialized staff, make an appointment to visit our design showroom or to get a quote. You won’t be disappointed! We have financing options available to help. 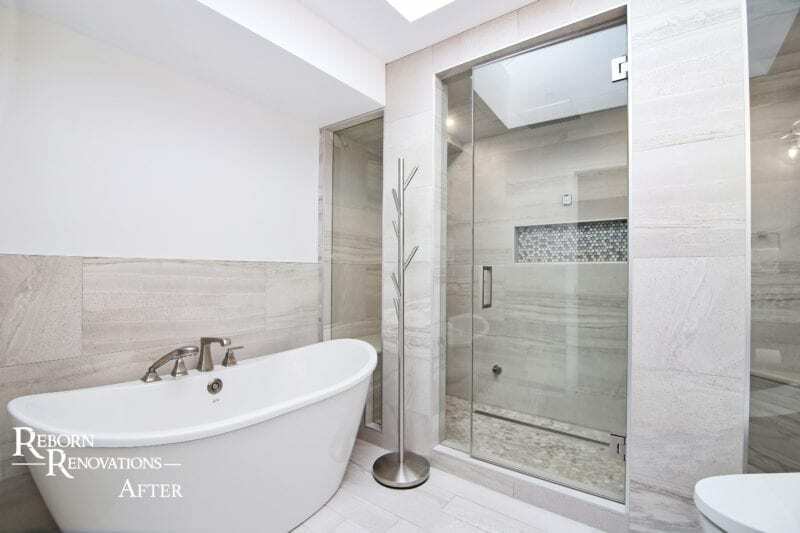 Reborn Renovations also provides commercial bathroom renovations including interior bathroom design, demolition and complete commercial bathroom renovation services. We’ve installed bathrooms in restaurants, offices and more. Get in touch today for an estimate. Ready to get a quote for bathroom remodel costs? Inquire today and one of our experienced staff members will get back to you shortly.